No Appointment necessary to get your bike serviced. Call 3862797908 or stop by today! 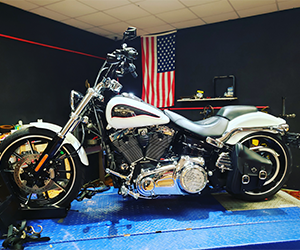 Heavy Metal Motorsports offers Deland the best variety of services for all different motorcycle makes and models, including Suzuki, Harley-Davidson, Honda, Yamaha, Kawasaki, Polaris, all types of custom choppers and more! From motorcycle repair to custom paint jobs, our expert technicians will service your bike at a rate that can’t be beat! All of our technicians are certified licensed motorcycle mechanics with years of experience. You can trust a motorcycle shop like Heavy Metal Motorsports that has been doing business in Deland, FL for more than 15 years. We will beat your expectations with our professionalism and quality of work! More than that, we provide full-service motorcycle repair that will fit your budget! We won’t overcharge you for labor — we get new and replacement motorcycle parts at a deal so that we can pass that savings on to you! But repair and maintenance aren’t the only services we provide. We do custom paint jobs, performance modification, LED lighting and wide tire kits. We also offer a number of motorcycle accessories that will set your bike apart from the crowd! You’ll be impressed with our friendly and helpful support team, who helps make Heavy Metal Motorsports the best place for motorcycle repair in Deland. Check out our custom paint gallery on our website!